Now that it’s finally beginning to look like winter in Los Angeles, it’s time to break out the comfort soups. I cannot begin to tell you how excited I am to see rain this winter, not only because of the severe drought we’re in but also because that means I actually get to wear my winter jackets! Last year was a complete disappointment with 80 degree days in the middle of December. Everyone says Los Angeles weather is the best, but I like my year to have at least a summer and a winter, not summer all year long. That being said, now that it’s getting a bit chilly in my house, I’m cooking up a hearty chickpea soup with spinach and Portuguese sausage. What can be better than wrapping yourself up in a soft blanket, watching trashy tv and eating a hot bowl of this soup? Nothing I say, nothing. Heat medium pot over medium-high heat. Add 2 tbsp oil. When the oil is hot, add sausage and brown, about 2 minutes. Remove sausage with a slotted spoon and set aside. Add onion, garlic, and red bell pepper to the same pot and cook until onions have softened about 7 minutes. Add tomatoes and paprika and let simmer for 10 minutes, stirring occasionally. Add sausage back to the pot along with chickpeas, bay leaf, thyme, and chicken broth. Bring to a boil. Reduce heat to medium-low and simmer for 20 minutes. Stir in the spinach and cook until wilted, about 3 minutes. Season with salt and pepper. Ladle soup into 4 bowls. Serve. I love making soups and stews because of the simplicity behind them. All you need are some basic ingredients, allow them to simmer and let the flavors meld and there you have your meal. 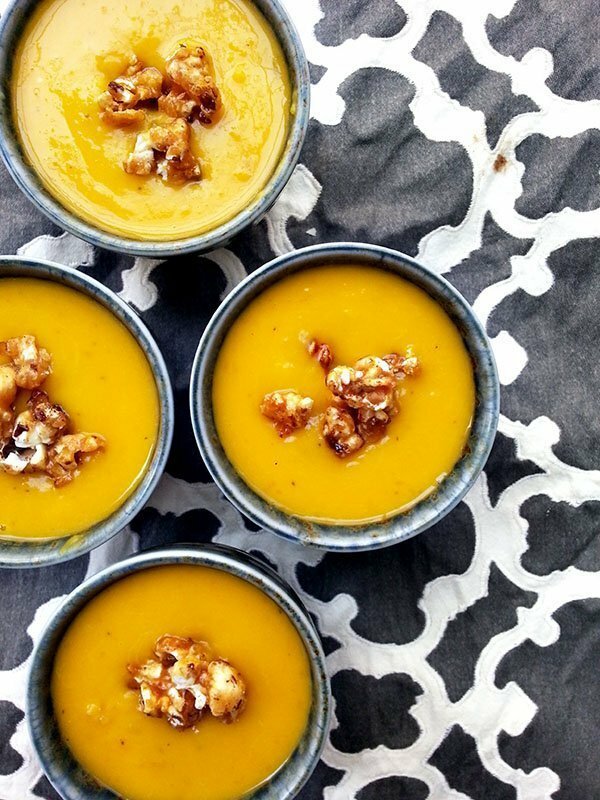 If you have limited time in the kitchen, prepare this soup and just let it sit while you go on with your busy self. Since I’m preparing this soup in December, tomatoes are the greatest right now. If you’re preparing this in the summer, go for fresh tomatoes. Otherwise, canned with do just fine. Add the Portuguese sausage and chickpeas and let those flavors all blend together. I wanted Portuguese sausage for this soup to add some spiciness to the broth. You can also use chorizo if you’re having trouble finding this specific type of sausage. Add some greens and there you have it! The smell alone from the chickpea soup warms me up. Soup on a cold day? Sure, why not. 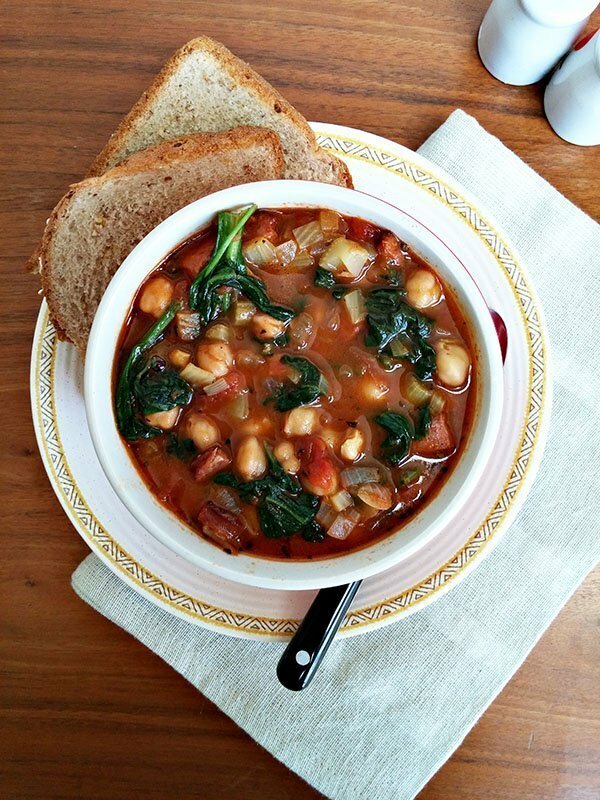 Chickpea soup with spicy sausage and spinach? Sign me up! This stew looks incredibly hearty, comforting and delicious - perfect for the miserable weather we're having here in Australia at the moment! This stew looks so perfect for the season, it's been so cold and miserable here in NY, I could use something warm and delicious like this! I'm just glad to actually have a winter in L.A. so I make stews like this!